With a motto to maintain long term relations with the clients we manufacture and supply and service provide Balcony Grill. The array is impeccable in finish. Owing to rich experience and knowledge, we offer our esteemed clients a range Glass Balcony Grill. Our array is impeccable in appearance and the grills and glass used is premium in quality. This product is easy to install and has long life span. Alluring look of the range adds to the grace of the outlook of the home, office, commercial center and shop where it is installed. 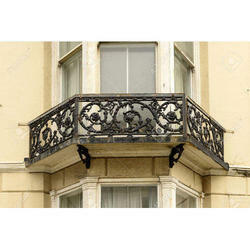 We have carved a distinct position as the leading provider of Mild Steel Balcony Grill. Offered range is designed using superior quality mild steel which is corrosion resistant and highly strong to withstand pressure. 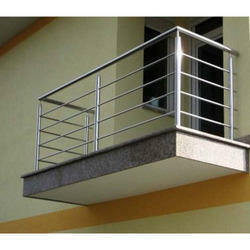 It gives safety and security and also enhances the look of the balcony. Mild Steel Balcony Grill requires less maintenance. Our organization offers our clients a huge array of Stainless Steel Balcony Grill. Some of the features of the array are ecstatic design, corrosion resistant, accurate dimensions, easy installation and low maintenance. Stainless Steel Balcony Grill has rigid structure and unmatched quality. Stainless Steel Balcony Grill is flawless in finish.